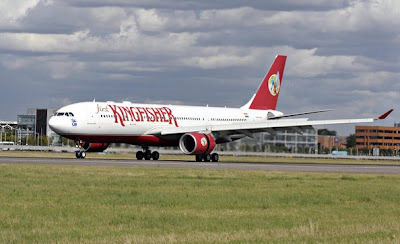 Kingfisher Airlines Ltd (BSE: 532747, NSE: KFA) on Monday, 9th April, saw continued selling by Promoter’s PACs. Redect Consultancy Pvt Ltd, a Person Acting in Concert (PAC) with the promoter, offloaded 32.51 lakh shares at Rs. 17.66 a share in NSE. The sale amounted to 0.56% of the company. StockExplain had earlier reported that another PAC, Star Investments Pvt Ltd, had sold off 128.48 lakh shares or 2.23% stake in Kingfisher Airlines for Rs. 21.34 crore on Tuesday, 3rd April. As on 3rd April, no large or identifiable buyers were visible in the KFA counter on Monday, as buyers against this significant sell, even though the counter again saw a massive day trade by Transglobal Securities Ltd. However, unlike the other day, Kingfisher stock lost ground on Monday, and closed down by 6.74% in National Stock Exchange, which signals that the wider market is not comfortable with the continued selling by promoter related entities, even at these relatively low levels. A key risk in the stock is that 90.17% of the promoter stake is pledged, which can cause a chain reaction on the downside if prices slip from the current supports. The official promoter group stake is 50.51% as per the latest Share Holding Pattern. The stake held by PAC entities like Redect Consultancy and Star Investments is apart from this official stake. While the latest SHP shows Redect and Star together holding 13.1% stake, the recent sells have already liquidated a minimum of 2.79% stake through identifiable sells. On the fundamental side, Monday was rather good for Kingfisher with the distressed airline managing to pay salaries for a large number of employees, including senior pilots and engineers, after a delay of four months, which has further removed chances of service breakdown due to staff strike. On Monday, the airline also managed to pay Rs. 9 crore as the second instalment towards TDS to the IT Department. Earlier, it had paid Rs. 44 crore to IT and Rs. 20 crore towards Service Tax, as the first instalment. But KFA’s problems are far from over, as it is stressed from multiple aggrieved parties for payments, like lenders looking for repayments, aircraft leasing companies expecting timely lease rentals, fuel suppliers looking for long pending dues, and tax authorities expecting taxes the airlines has already collected from consumers. While its pending income tax amounts to Rs. 349 crore, another Rs. 60 crore is pending as service tax, and both the concerned departments had recently made it clear that no concessions would be allowed on those payments. But the bigger problem facing Kingfisher Airlines is its accumulated losses and mounting debt, each around Rs. 6000-7000 crore. Even though lead banker State Bank of India had recently remarked that the airline can be made viable again if fresh equity is injected, SBI itself expects the equity infusion to take considerable time, if at all. SBI and co-lenders like ICICI Bank, IDBI Bank, Bank Of India, & UCO Bank, had agreed to partly convert their advances into equity, and after such conversions they together hold 15.19% in the airline. Kingfisher is trying to battle it out by keeping its cash flow options open. In a surprise move, it had reportedly sold off its ticketing inventory at a 50% discount to travel agents that has resulted in air fares that are up to 65% cheaper than rivals. From its peak operation of 400 flights using 64 aircrafts, it is now down to 120 flights with 20 planes, half of which are the smaller ATRs. It had also asked around half of its 7000 employees not to report for work until the financial situation improves. Through Monday’s sell, the promoter’s PAC, Redect Consultancy has raised Rs. 5.74 crore.